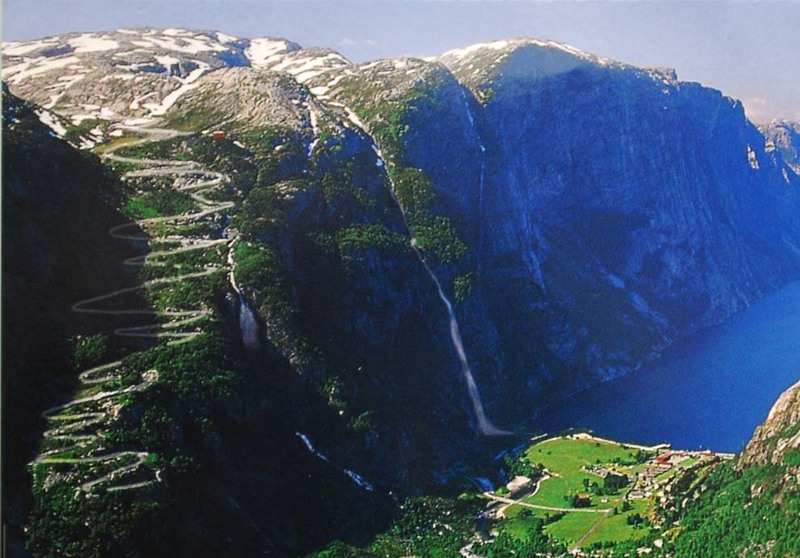 Want to do a hike while you’re touring on your bike around in Norway? Throw in a visit to Kjeragbolten. 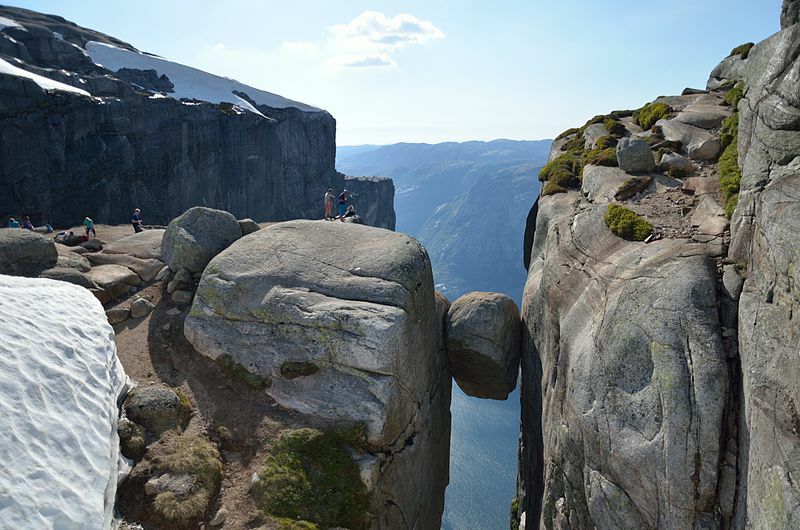 The Kjeragbolten is worth a visit – but be prepared for a real hike to get there. Most lightly you have seen pictures of it before. The five cubic meter large rock that is wedged into a split in the mountain some 1000 meters above sea level. From pictures it often looks a lot scarier than it really is, because it’s quite possible to go out on the rock without any special equipment. You shouldn’t suffer from height anxiety, though. You cannot ride to the Kjeragbolten, though. You must park your bike at Kjerag Restaurant and walk from there. It’s about 2-2.5 hrs walk each way, so make sure you bring proper hiking boots if you want to walk there. The sweet thing, though, is that you can ride down to Lysebotn along the most magnificent serpentine road you ever saw with 32 bends and a “no caravans” warning, stay there at the camp or at a guest house in the area, and set aside the next day to do Kjeragbolten. The Kjerag Restaurant is at the top of this serpentine road, so you get to ride it down, up, down and up again if you stay for a night and do the walk. It couldn’t hurt with a resting day from all the the riding anyway. This route takes you from Oslo, over Dalen to the Suleskar Mountain Road, and further to Lysebotn. You’ll see the sign to Kjerag Restaurant/Kjeragbolten before descending down the serpentine road to Lysebotn.